Shortly after the Boston bombings, an article which had appeared in the Emerson College (Boston) newspaper, The Beacon reached my desk. The article was accompanied by the picture of a boy, a cute teen who had just started at the college, and who was attempting to keep kosher. Part of his family keep kosher and he has been kosher since he was nine years old. Now, he is studying at a college away from his home. With no kosher options in the school, he has tried to do it on his own, the way he understands kosher to be. I won't describe here his personal decisions on what is acceptably kosher, but I will point out that he purchases some food on his own and has the dining hall manager, who is Jewish, help prepare these foods in a kosher manner. (Let us not attempt to discuss the halachic issues involved with such an arrangement.) Karen Nahary, Emerson’s Hillel club advisor said that this boy is not alone in his struggle for creating kosher meals in the dining hall. “Students have come to me before,” Nahary said. “A lot of them who want to eat kosher have trouble here.” Unfortunately, there is not enough interest in kosher at Emerson for Hillel to offer a kosher alternative to the students. Karen Dickinson, director of business services, said that she has never received complaints about the lack of kosher. “Emerson's Dining Hall does not have the appropriate space or infrastructure needed to support kosher options,” Dickinson wrote in an email. “I personally have not received complaints regarding kosher options.” Obviously, students and parents have not approached the school itself for help. KASHRUS wishes to discourage efforts such as this boy undertakes — to live “creatively kosher” in a non-kosher environment — especially for a teen living in a college dorm. Many teens drop their commitment to kosher in those crucial four years of college even in schools with kosher food plans and so much more so in such a school as Emerson with no kosher food plan. At the same time, we advise all readers who live in a community nearby a college to reach out to the school in your area to identify those students who are struggling to keep kosher and would appreciate some help and a Shabbos invite. Many decades ago, my mother, z”l, did reach out to a local girls college near where we lived, She posted a little sign inviting anyone interested in a Pesach seder. One young girl, struggling with her religious identity, came and went on to become a fully observant member of the Jewish community. There are many such people struggling with their Jewish identity and commitment in our midst. This year, the “Mashgiach of the Year” award has expanded, as you will see, and we hope in future years to continue to increase the scope of the contest. 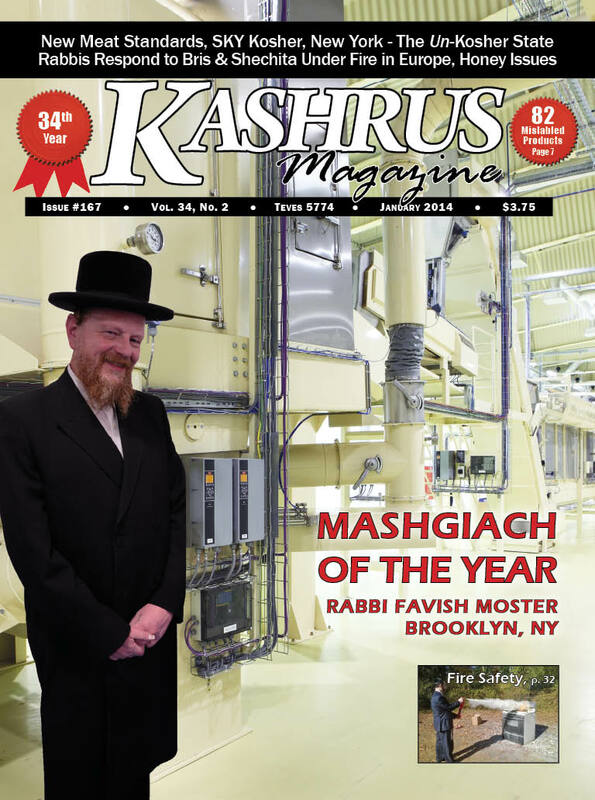 The “Mashgiach of the Year” is chosen by the staff at KASHRUS Magazine through phone interviews with candidates who are nominated by any of the 1,253 kashrus agencies. We look for an outstanding mashgiach, someone who commands respect from the kashrus agency he works for and someone who exemplifies what a good mashgiach is: knowledgeable, committed, unswerving, loyal, and a hard worker. There are many other mashgichim who are worthy of awards for their efforts, but our man has to be good, really good. Maybe in years to come some of the other nominees will be chosen as “Mashgiach of the Year,” but this year, this man has shone out. Obviously, the term “Mashgiach of the Year” does not mean that this particular year was our awardee’s best year ever, but it is the year that we discovered how good he is at what he does. There were three areas of change this year. 1. For the first two years, our “Mashgiach of the Year” was a man who worked in foodservice, principally for caterers. One of our most basic stipulations was that we offer the title and the $1,000 cash award that accompanies it to a mashgiach, not to a supervisor who has mashgichim working for him, nor a rabbinic coordinator, a rabbinic field representative or a rav hamachshir. This award is intended for the man on the ground, the “infantryman” of kashrus, so to speak, the man who gets the job done where food is being produced. The mashgiach has a very demanding job, does not get top pay, and, is, what we like to call, the “unsung hero of kosher”. We are proud that we can give one mashgiach each year the title of “Mashgiach of the Year” and a $1,000 award and a gift selection of fine meat products from Rose Gourmet (Brooklyn, NY). This year’s winner is in a high tech plant that produces flavors which are used in food production. He is the lead mashgiach in a plant with 500 workers and overseas a colossal amount of production. A seasoned mashgiach, Rabbi Favish Moster, mashgiach for OK Kosher Certification at the New Jersey plant of International Flavors and Fragrances (IFF), won this year’s award. 2. The second change is the addition of a “runner up” award. Although Yehoshua Levy, a route mashgiach for the Kashruth Council of Canada (the “COR”), did not receive a cash award, he did receive a gift certificate to Tiferes Stam, Brooklyn’s Judaica center. We are happy that Mr. Levy is also our first mashgiach to be awarded from outside the U.S. His keen business sense is put to good use monitoring fifteen establishments where he oversees food production. 3. This year, one of the sponsors of our “Mashgiach of the Year” contest was Diversified Business Communications, producers of the popular Kosherfest trade show. They asked KASHRUS to present the award the winner at a special ceremony at Kosherfest 25. A large crowd attended the ceremony when we presented Rabbi Favish Moster with the $1,000 check and proclaimed him “Mashgiach of the Year.” The prominence to our contest that ceremony added helps mashgichim everywhere gain widespread appreciation. To read more about the Mashgiach of the Year, click "Buy this issue now" or "Subscribe" at the bottom of this page. Just before last Pesach, the kosher world erupted when a new meat scandal — one of great proportions — was discovered. The owner of a major meat processor and distributor in California was found to be smuggling into his plant, certified as “glatt kosher,” what was either non-glatt or non-kosher meat. This happened over a period of time and was corroborated by a series of videos taken by a private detective. When the story broke, many hundreds of families were forced to decide what to do with their meat and with their cooking utensils. People felt violated, as if the kashrus agencies did not do their due diligence. Businesses scrambled to decide which kosher agency to choose. It was a very wild time. At KASHRUS, we chose to let the dust settle and see where kosher was going before commenting. In the spring and in the summer, many of the kashrus agencies conferred by telephone and new minimum practices were advanced. Then, at the AKO Membership Conference, which was held at the offices of the “OU” on October 31, thirteen guidelines were accepted as being the minimum standards member AKO kashrus agencies should employ. (See facing page.) Properly carried out, this list of guidelines can go very far to prevent future abuse of kosher. A Look At The New Guidelines At one glance you will see that the kashrus agencies realize that with a complicated and serious issue such as meat supervision, it is absolutely necessary to develop a multi-pronged approach. Also apparent is that the mashgiach is still the most important link in the chain. But, the new guidelines point to more due diligence on the part of the kashrus administration to monitor the work of the mashgiach, to supervise him and to aid him in his work. To that end, AKO is producing a CD for all mashgichim who work in meat production, to give them the proper background and guidelines in this area. Other Developments in Meat Supervision It is important to note that these are minimum standards. Indeed, there are kashrus agencies which have gone far beyond these guidelines and they are developing some very sophisticated systems. We wish them much success and trust that other agencies will voluntarily accept those innovations or create their own. Notably, we have been informed of a plan that the “OU” is working on which should prove significantly secure. Likewise, we have begun studying a very unique system that Kedassia of London, England has put into place. Hopefully, we will be able to go into more details in an upcoming issue. To read more about the New Glatt Kosher Meat Standards, click "Buy this issue now" or "Subscribe" at the bottom of this page.